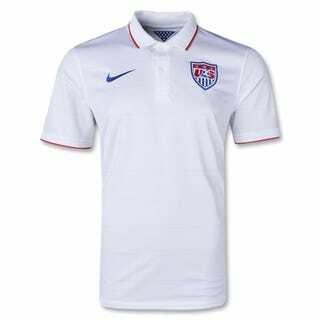 The bland, golf shirt-looking thing that leaked last month has turned out to be accurate—this is U.S. Soccer's home jersey for 2014, and will be worn at this summer's World Cup in Brazil. U.S. Soccer officially unveiled the Nike jersey this morning, and reaction has not been kind. Though the standard badge is back, replacing the centennial patch on the last iteration, there's not much that stands out. No contrasting cuffs or collar (as in the last World Cup jerseys), no standout stripes, and no return to the diagonal sash design, which had been rumored. There is one bizarre addition: In the players' name and number on the back, you can find the U.S. Soccer crest and the words "One Nation. One Team." But only under UV light, a situation that won't ever come up, so it is effectively useless. The full kit includes white shorts (with a red stripe down the side) and white socks. That's a lot of white. Maybe the USMNT will have the last laugh when it hits 100 in Manaus.